I have been selected by The Kraft Heinz Company to be a spokesperson for VELVEETA. While I have been compensated for my time, my opinions are my own. Looking to spice up your favorite cheesy shells? 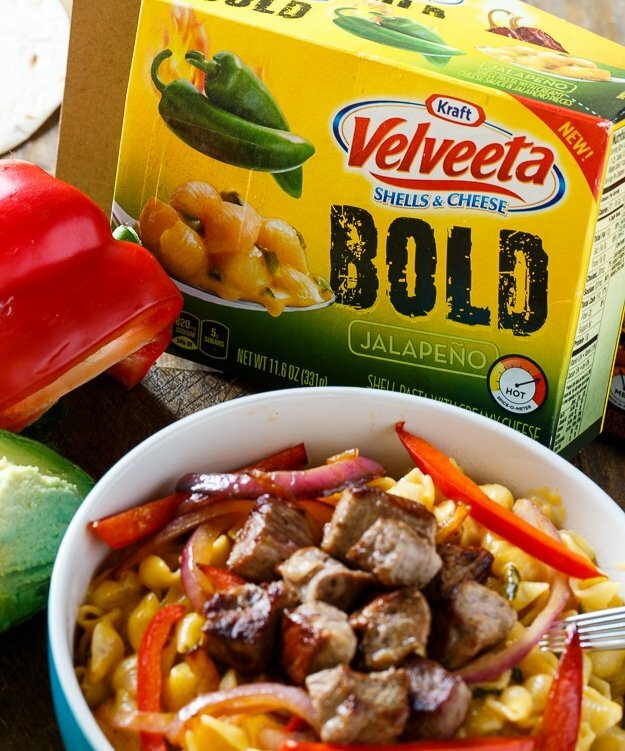 Velveeta has two new flavors of Velveeta Shells and Cheese: Chipotle and jalapeño. Enjoy them in a bowl on their own or with a few add-ins, one box can become an easy dinner or perfect finger food for the next football game. 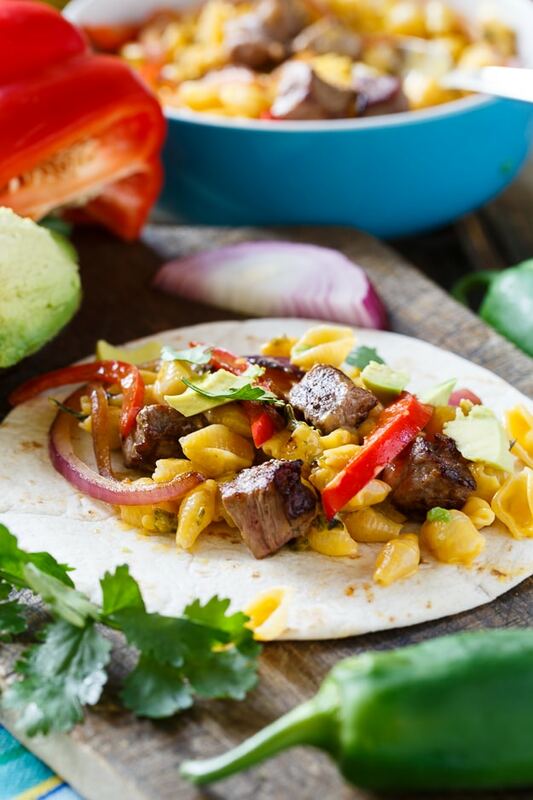 I added seared steak, peppers, and onions to Velveeta Shells and Cheese Bold to make fun and delicious Mac and Cheese Steak Fajitas. 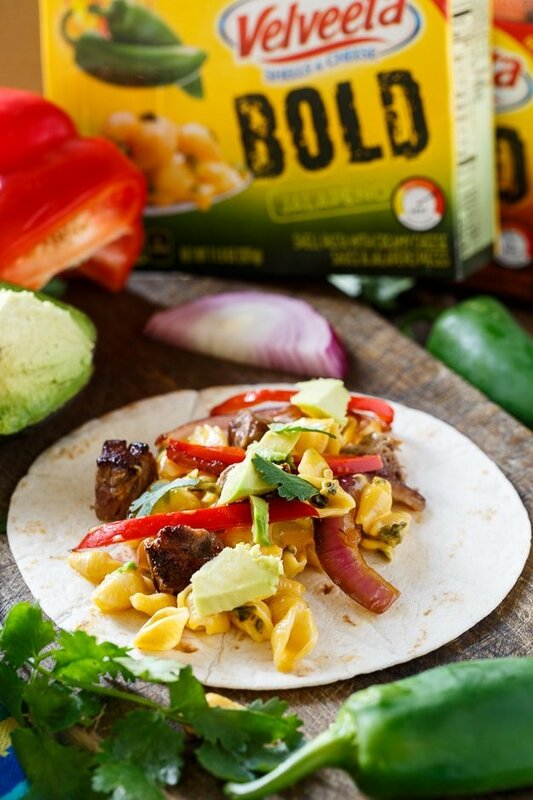 Because Velveeta Shells and Cheese Bold already has so much spice and seasoning, you really don’t need to season the steak, onion, and peppers with anything except a little salt. In the time I made the shells and cheese, I had cooked the steak, onions, and peppers in my cast iron pan and they were ready to be mixed into that irresistibly creamy mac and cheese. 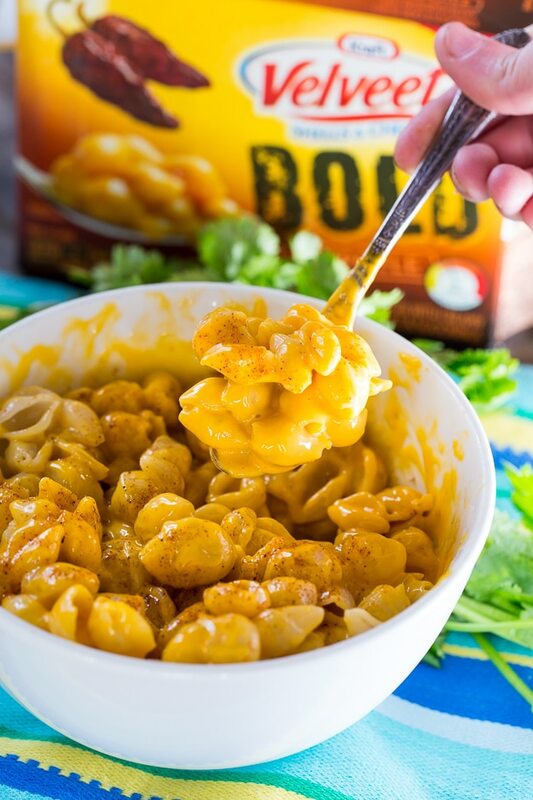 The only decision is which flavor of Velveeta Shells and Cheese Bold to use. The chipotle has a medium spice level and is wonderfully smoky. Jalapeño REALLY has some spiciness. But the nice thing is the jalapenos come in a separate spice packet so if you don’t want to go full force with the jalapeños , just don’t add the whole packet to the mac and cheese. 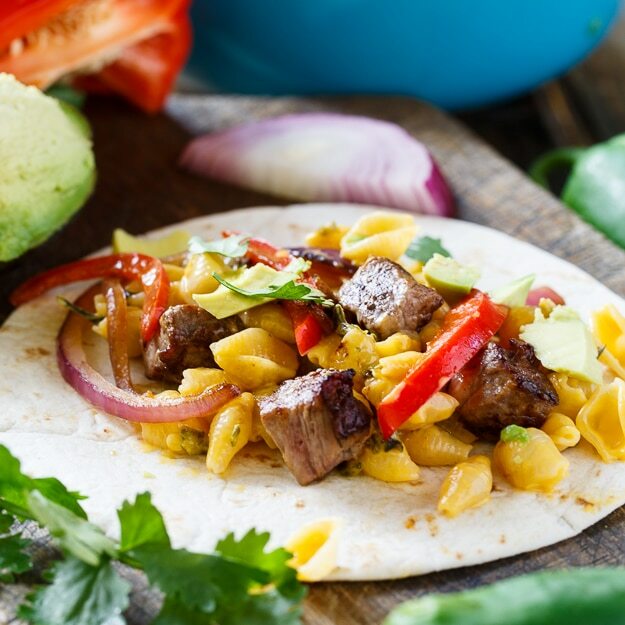 Either works well for these Mac and Cheese Steak Fajitas. 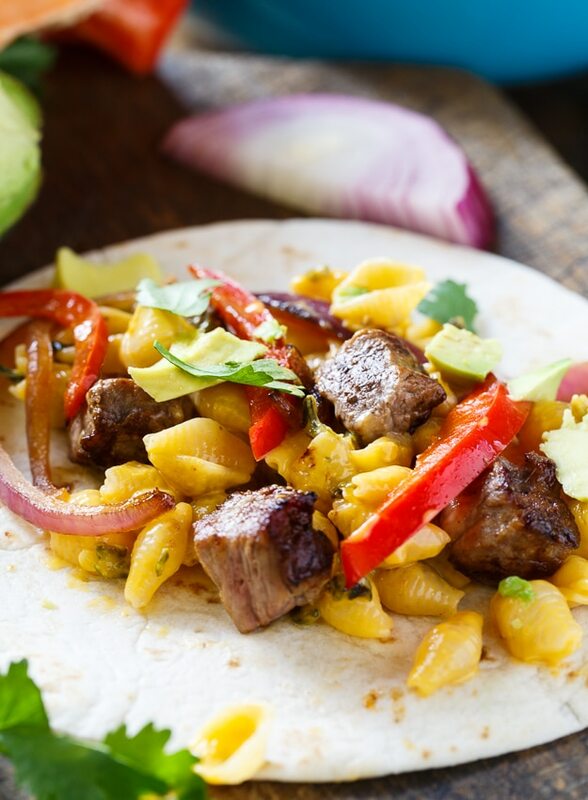 Once the steak, onions, and peppers are mixed in, just place a pile of tortillas on the table and maybe some diced avocado and chopped cilantro and everyone can help themselves to a Mac and Cheese Steak Fajita with a super spicy kick. 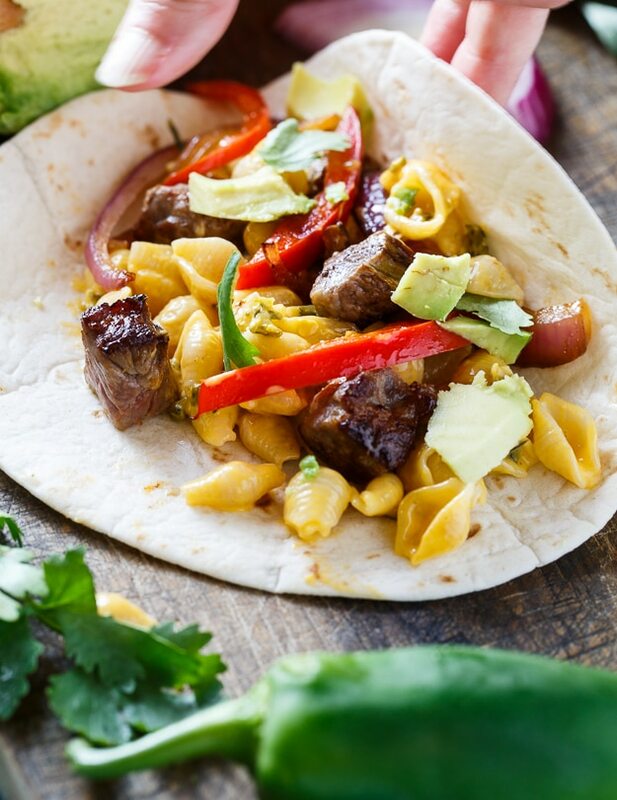 No need to add cheese or sour cream to these fajitas. The mac and cheese adds all the cheesy creaminess you need. 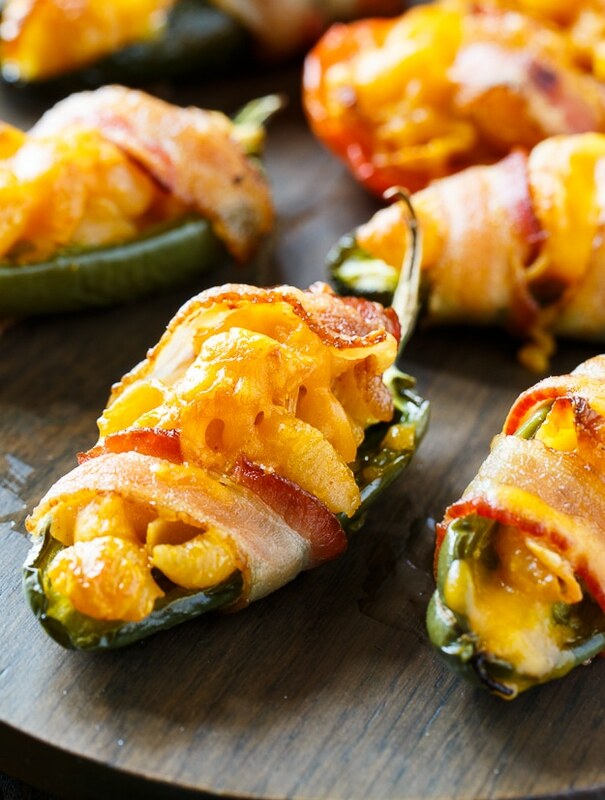 You can also whip up some Mac and Cheese Jalapeño Poppers with another box of Velveeta Shells and Cheese Bold. Just cut open some jalapeños, scrape out the seeds, fill them with cooked Velveeta Shells and Cheese, wrap half a slice of bacon around the jalapeño and bake at 400 degrees for about 25 minutes. Wowza! Talk about a spicy game day treat. And with Velveeta Shells and Cheese AND bacon, it doesn’t get any better tasting than that. For more information on Velveeta Shells and Cheese Bold, visit www.velveeta.com . Cook Velveeta Shells and Cheese according to package directions. While shells and cheese cook, heat oil in a skillet (I like cast iron) until very hot. Add steak pieces. Do not move them until they get a nice sear on the bottom. Flip steak pieces over and cook just a little while longer. Remove to a plate and set aside. Add onion and peppers to pan and cook until slightly soft. Add steak, onion, and pepper to Shells and Cheese. Serve with tortillas, avocado, and cilantro. Yield: 4 dinner servings or 8 appetizer servings. This entry was posted in Appetizers, Dinner, Lunch, Main Dishes and tagged beef, fajitas, mac and cheese, Mexican. Bookmark the permalink. Oh my goodness. Two of my fav foods coming together. Also, love the stuffed pepper! Ooohhh always love me some fajitas. Those look great 😀 Pinned! 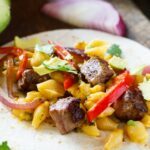 Mac and cheese in fajitas?? This looks like awesome comfort food!! I haven’t had even plain old regular fajitas in far too long!! What a pretty dish, Christin! I love the flavors and pops of color. I would definitely dig into these fajitas and devour them all! Wow! Mac and cheese are just so awesome. And Fajitas and the jalapeño poppers look so delicious. Ummm whoa. Is there anything mac and cheese doesn’t go with??? I don’t think so. These seriously look absolutely sensational! They are so so inventive!